Before Stampfest I was working on cards for the display boards and we needed some for the Glitter Lace Technique....this is always a popular technique at the shows too:) So I thought I would share some of the different ways you can use the background after it's made. If you are not sure how to do this technique you can view a video and details here. My first sample just uses the full page with a circle cut out and the sentiment stamped and embossed in the center....pretty simple, but very sparkly and pretty! 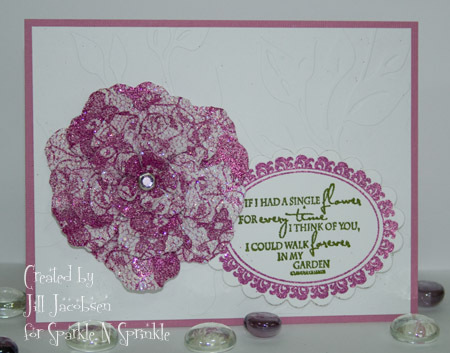 My second sample takes the sheet of Glitter Lace Background and I used the Spellbinders Rose Creations dies to cut out the rose and a brad in the center to hold it together. 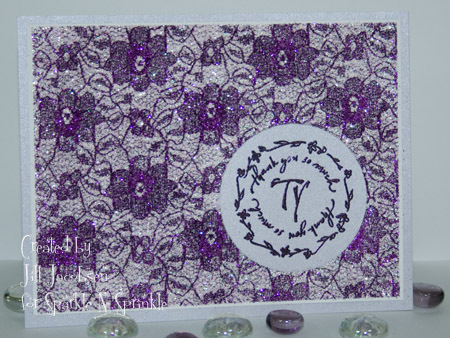 Then I used the Tuscany embossing powders and the Thoughtful Frames stamp set for a sentiment. Again, simple but striking. The last one is one I demo a lot at the shows. 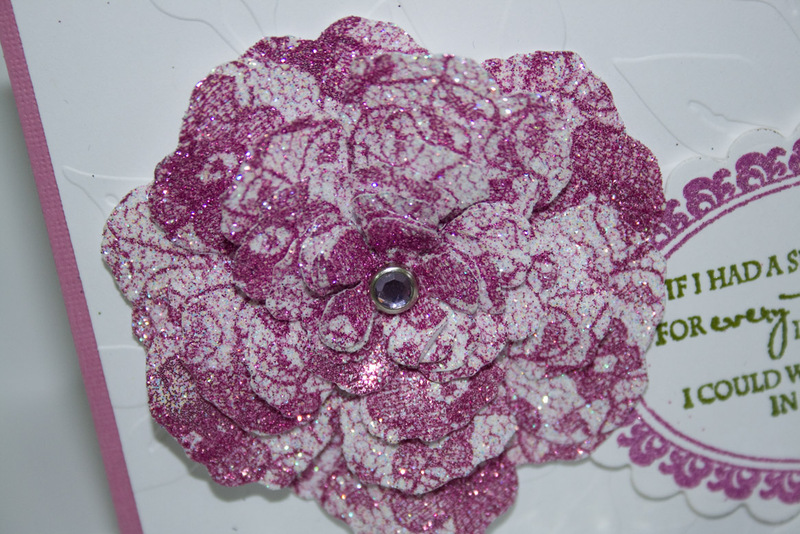 This particular lace is a rose pattern and I use different colors of glitter...here I used Fire Engine Red. 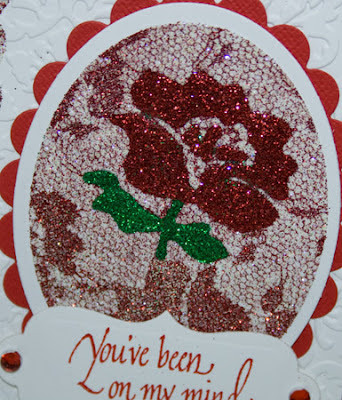 After I made my background I used the Spellbinders Oval dies and cut out one rose, then using Sparkle N Sprinkles Dimensional Glue go over one individual rose and cover it with more Fire Engine Red glitter...then do the same with the stem and leaves and use Shamrock glitter.....this really makes it pop. Then for the side strip I just used a border punch on the left overs. Hope you try this technique soon and have some glittery fun!! How quickly we forget all these awesome techniques! These are all super samples. You done good! Real' good! Love how you used the lace technique in so many ways! Great ideas and so SPARKLY! Love all the cards - so elegant! Beautiful cards! I haven't used this technique in a long time. Thanks for reminding me and for sharing! These are lovely Jill, definitely need to try that technique!